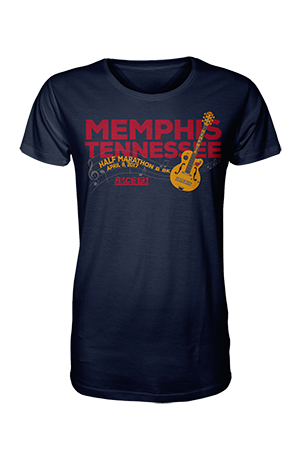 Race 13.1 returns to the Home of the Blues for the second Race 13.1 Memphis half marathon and 8k on April 8. Starting and finishing on Mud Island, participants will enjoy beautiful water views as they run along the Mississippi River before heading over the Wolf River Harbor on A.W. Willis Bridge, overlooking the Memphis Pyramid. Once over the bridge, runners will proceed through the heart of downtown Memphis, passing City Hall, Civic City Plaza and the beautiful Memphis Park. The next section of the course is a beautiful stretch on Riverside Drive, a street whose name says it all - running along the Mississippi River and Tom Lee Park. Returning on Riverside Drive, runners will turn onto the iconic Beale Street, "Tennessee's Top Tourism Attraction" and the "Official Home of the Blues" that was named America's Most Iconic Street by USA Today and is filled with great BBQ restaurants! The next stretch of the course takes place largely on N. 2nd Street, which will provide beautiful Wolf River Harbor views until runners return to the finish along the Mississippi River back to the heart of Mud Island. 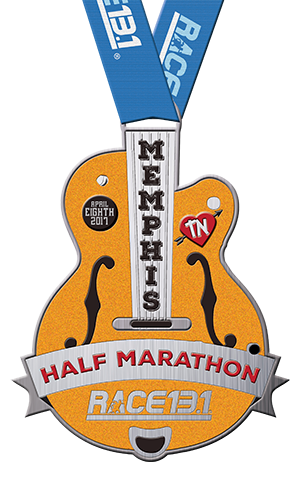 Beautiful course through the heart of Memphis, filled with scenic views of the Mississippi River, Beale Street and the heart of downtown Memphis! The race is on Saturday, April 8, 2017. The official start time for the half marathon will be 7:00 am, and the 8k will start at 7:15am. Each racer will receive this race tech t-shirt. We will offer both men’s and women’s size shirts. All participants will also receive access to numerous Event Deals. A link to view and claim the Event Deals will be emailed out prior to the race and can be found on the race page. If you choose to register at packet pick-up on race day, we cannot guarantee a race t-shirt. They will be available to race day registrants on a first come, first serve basis while quantities last. All half marathon finishers will receive this finisher medal! 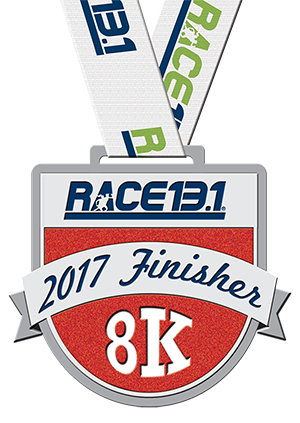 All 8k finishers will receive this finisher medal! Yes, awards will be given to male and female overall and age group winners based on chip time. Overall awards for the 8k will be given at 9:30am, age group awards may be claimed at the Race 13.1 Customer Service tent following the awards presentation. Overall awards for the half marathon awards will be presented at 10:00am, age group awards may be claimed at the Race 13.1 Customer Service tent following the awards presentation. Winners must be present to receive their prize; awards will not be mailed out. Age group winner receive a medal! Age groups are as follows: 19 & under; 20-24; 25-29; 30-34; 35-39; 40-44; 45-49; 50-54; 55-59; 60-64; 65-69; 70-up. Free parking is available at the Overton Square Parking deck until 6pm (2094 Monroe Ave, Memphis, TN 38104). Once parked, participants should exit onto Trimble St and cross Trimble St to access Breakaway Running. Saturday, April 8 (Race Day): 5:15-6:15am in Runners Village near the start/finish area (1000 Island Drive, Memphis, TN). The course will have feature plenty of aid stations with water and sports drink will be served at the aid stations. We will have at least one Port-A-Johns at each aid station on the course. Yes, however, you must meet the requirements of the completing the race by 10:30am.